There could be some celestial fireworks in a few days. The Geminid Meteor Shower has been displaying increasing activity over the last 2-3 years. Observers have been counting 120-160 meteors per hour, and those rates are rising. Plus, this time around, the Moon won’t interfere with viewing. If your night sky is dark and cloudless, conditions will be ideal for observing the Geminids — so named because they appear to come from the constellation Gemini. Meteors are sometimes called shooting stars or falling stars, but they’re not really stars. The glowing trails you see in the sky are made by tiny pieces of rock and ice as they slam into Earth’s atmosphere at speeds of 30-40 km/second (20-30 miles/second). At such high speeds, these particles (most smaller than a popcorn seed) cause gases in our atmosphere to ionize and emit light. Bluish-white is the most common color. It’s the same color as lightning bolts. Both phenomena ionize nitrogen, which makes up 78% of our air. Most meteor trails occur at altitudes of 75-100 km (45-60 miles). The occasional large meteor, called a fireball or bolide, can arc across the entire sky and be bright enough to light up the surrounding landscape. Fireballs can add additional colors from their own chemical components: greens, yellows, and reds are common. Some break apart, creating multiple trails that can persist for minutes. You might see a few fireballs if you observe all night, but there’s never any guarantees. The graphic above explains what’s happening. There are streams of cosmic debris orbiting the Sun along with the planets. This debris comes from comets or asteroids that have fragmented. 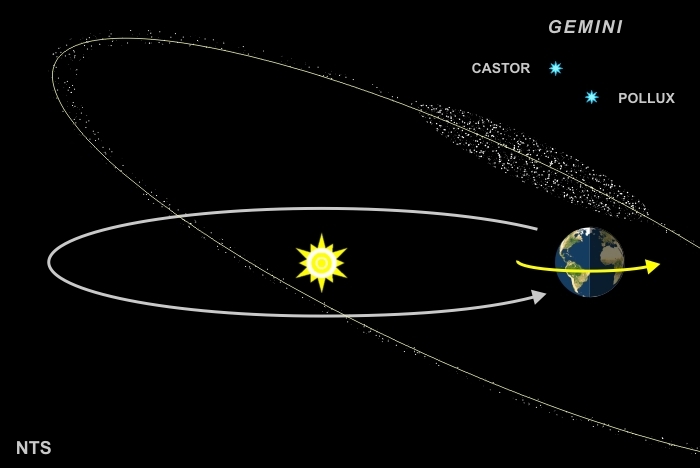 Over time, that debris gets distributed around the entire original orbit. But the distribution of debris is far from uniform. There are clumps of higher concentration in some places. And this year, Earth could be passing through one of those clumps. On the night of December 13th, Earth will plow into the the debris stream left by an asteroid designated as 3200 Phaethon. When that happens, we’ll see a Meteor shower. The visual effect is much like driving into a snowstorm. Everything appears to be coming from a point directly in front of you. Cars driving in the opposite direction see the same thing, since it’s the observer’s motion that creates this illusion. In December, Earth’s motion around the Sun is carrying it toward Gemini. So the meteors appear to radiate from a point in that constellation. If you study the graphic, you’ll see why the best observing is between midnight and dawn. Between those two times, the rotating (note yellow arrow) Earth will bring you directly into the “line of fire.” Between sunset and midnight, you’re basically facing away from all the action. Meteor showers are somewhat unpredictable events. We know approximately when to expect them, and have cataloged 21 distinct showers that occur throughout the year. Most showers spread out over several days, with a predicted peak activity on a single date. But sporadic meteors, not associated with a specific shower, can be seen on any dark night. To improve your odds of seeing Geminid meteors, turn off all outside lighting, dress for warmth, get yourself a comfortable reclining chair, and set up looking toward the eastern sky. If you have a clear view, unobstructed by trees or buildings, even better. Gemini rises in the east around midnight. It’s not a very distinct constellation, but its two brightest stars, Castor and Pollux, are nearly identical in color and brightness. You’ll know them when you see them. Telescopes or binoculars are not required. All that’s needed are dark skies and patience. The Geminids will peak between midnight and dawn on the morning of December 14th. Good luck observing, and have fun watching this celestial display.